Amboise, a small town in the Loire Valley, is known primarily for its overbearing medieval castle- once home to some of France’s most famous rulers, as well as to Catherine of Medici’s ten children! Amboise is also renowned for Clos-Lucé, the stately home where Leonardo da Vinci (invited by the French King Francois I) spent the last years of his life. We recently discovered that Amboise is also noted for it’s Sunday morning open-air market- for us, this meant the discovery of some new cheeses and cheese desserts. At first I thought it was a mistake- that the unidentified food item sitting on the vendor’s booth was burnt, really burnt. 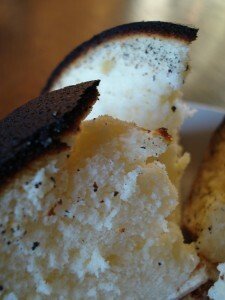 Turns out, that’s the way a tourteau au fromage is supposed to be. Made from thick, creamy fromage blanc this cake is originally from the Poitou-Charentes region of France. Outside, it’s round and looks like a turtle shell, or rather a crab shell (in French, a tourteau is a large crab). Did I mention it looks like a burnt crab shell? Inside, it’s light, airy and slightly sweet. We were told we could eat this delight either with an aperitif or for breakfast- it didn’t actually make it that far. 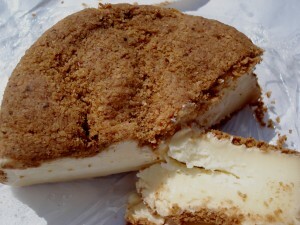 The next foodie adventure was camembert au Calvados– basically soft cheese soaked in alcohol and then covered in bread crumbs. Calvados is a brandy made of distilled apple or pear from Normandy. I had trouble deciding if I actually liked this cheese or not- it was smooth and creamy like ordinary camembert, yet had a very strong kick, thanks to the Calvados. We ended up saying, “It’s different.” Definitely worth trying, but might not make regular appearances on the cheese platter. Next post: Still in the Loire, but this time…chocolate in Bracieux. This entry was posted in Travel in France, Wine & Cheese and tagged castles, cheese, loire valley, markets. Bookmark the permalink. I have been to that little town! What a delightful little spot. Winding streets, sweet cafe’s…and Leonardo! He was prolific…and amazing. Will have to seek out that cheese…it looks really yummy. Thanks for the reminder about our visit there in 2001.